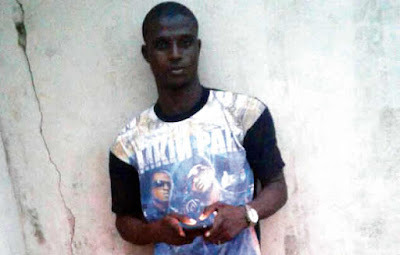 A 23-year-old barman, Samson Michael, has been arrested for the murder of his neighbour, Tobiloba Osho, by the Lagos State Police Command. Osho reportedly bled to death after he was stabbed in the chest by Michael during an altercation in their residence on Mabayoje Close, Alakuko area of the state. It was learnt that a 17-year-old daughter of the Pastor of a church where Michael lived had accused him of sneaking to where she slept inside the church in the midnight, fondling her pants. It was gathered that Michael swiftly returned to his bed in the church when he discovered that the girl was awake. When the day broke, she was said to have reported Michael to the pastor, his mother and Osho, who lived in a compound next to the church. The incident happened on Thursday, September 13. The Punch learnt that Michael got angry when his mother told him about the girl’s allegation. He was said to have confronted her on the grounds that she lied against him which led to a scuffle. Osho reportedly intervened and engaged Michael in fisticuffs. In the ensuing fracas, Michael reportedly stabbed Osho in the chest with a knife. The deceased was rushed to some private hospitals in the community before he was taken to the Ota General Hospital, Ogun State, where he was confirmed dead on arrival. Michael was arrested by policemen from the Alakuko Police Division where the case was reported. Osho’s next-door neighbour, who gave his name only as Kola, said he was in the bathroom when the fight broke out, adding that he tried in vain to caution the deceased. Kola said, “Samson (Michael) was an in-law of the pastor. His sister is the pastor’s wife. The girl in question is the pastor’s daughter from his first marriage. Samson and the girl usually sleep in the church. “That Thursday morning, the girl told Tobiloba (Osho) that Samson touched her pants while she was asleep in the night. After a few hours, I heard Tobiloba and Samson exchanging words over the issue. I was in the bathroom. I asked Tobiloba to be patient and wait for me. The pastor, Samson Enitan, told The Punch that it took some time before he could separate Osho and Michael, adding that how Osho was stabbed remained a mystery to him. He said, “I was praying in the church that morning when my daughter reported to me that my in-law, Samson, fondled her pants in the night. I told her to report him to his mother, who lives in the building at the back of the church and I resumed my prayer. “I was at it when I heard Samson and my daughter exchanging words outside. I stopped the prayer and intervened. By the time I got there, he had beaten her. As I was trying to settle the issue, Tobiloba came and confronted Samson over the same matter. They started fighting, smashing each other on the ground. “I could not separate them. At a point, they both left each other and rushed to pick weapons. While Tobiloba went for a broken bottle, Samson got a knife as they continued fighting. After more effort, I was able to collect the knife from Samson and I went to keep it inside a hole in the church window. Before I came back, Tobiloba had slumped in front of the church. I cannot explain how he was stabbed. The mother of the suspect, Rachael, said she did not believe it was Michael who stabbed Osho, claiming that there was no bloodstain on the knife. “He just finished learning tailoring at Ijebu in Ogun State. He came to Lagos to work so he could get money to do his freedom and set up his own shop. He works as a barman in Dalemo (a neighbouring community),” she added. The Lagos State Police Public Relations Officer, CSP Chike Oti, who confirmed the incident, said the suspect had been transferred to the State Criminal Investigation Department, Yaba for further investigation. He said, “A resident of Mabayoje Close, Alakuko, reported that around 11.30am of September 13, one Samson Michael stabbed one Tobiloba Osho of the same address with a kitchen knife in his left chest because of a minor misunderstanding.